1. Place egg whites in the bowl of a stand mixer and whisk on low speed until frothy, about 30 seconds. Increase speed to medium-high and, watching carefully, beat until soft peaks form, about 90 seconds. Reduce speed to medium. With mixer running, add half of sugar and beat until incorporated, about 30 seconds. Transfer whites to a large bowl. Do not wash bowl. 2. Add egg yolks and remaining sugar to now-empty stand mixer bowl and beat at medium-high speed until pale yellow and creamy, shutting off machine and scraping down sides with a rubber spatula as necessary, about 2 minutes total. Add pumpkin puree and pumpkin pie spice and mix on medium-low speed until homogenous, about 15 seconds. Add milk, cream, and alcohol and mix on low speed to combine. 3. Using a rubber spatula or handheld whisk, fold the whipped whites into the egg yolk/milk mixture until completely incorporated. 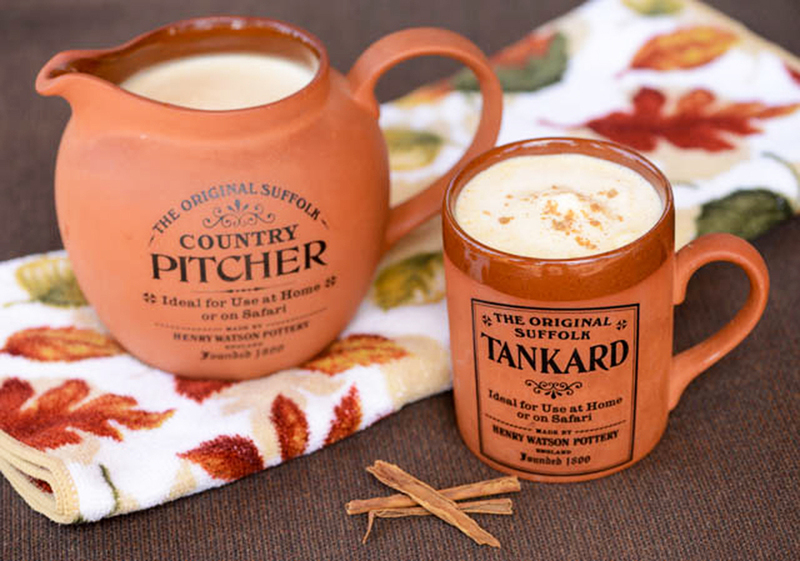 Serve by ladling into mugs and garnishing with whipped cream (if desired), pumpkin pie spice, and a cinnamon stick if desired. *to make non-alcoholic substitute alcohol with 2 teaspoon rum extract. **To make a Pumpkin Latte, warm 1 cup eggnog mix on stove over low heat or in microwave, pour 1 shot of espresso into a mug, top with whipped cream and pumpkin pie spice.